Defending champion Sloane Stephens crashed out of the Miami Open in the third round, while Simona Halep and Karolina Pliskova avoided upset losses. 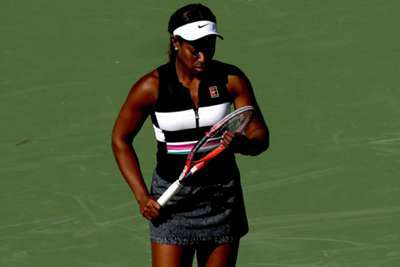 Stephens, last year's winner, was well beaten by Tatjana Maria at the WTA Premier event on Sunday. The American was one of five seeds to exit as the likes of Anastasija Sevastova and Daria Kasatkina also departed. However, while they needed three sets, Halep and Pliskova managed to book their spots in the last 16 in the bottom half of the draw. Stephens had won her only two previous meetings with Maria, but the 2017 US Open champion was no match for the German this time. Maria was a convincing 6-3 6-2 winner in a clash lasting just over 90 minutes in Florida. Stephens has endured a tough start to the year, holding just a 6-6 win-loss record. Awaiting Maria in the last 16 is Marketa Vondrousova, the Czech teenager upsetting 16th seed Elise Mertens 6-4 7-6 (7-1). Vondrousova, 19, has enjoyed a stellar start to the year, reaching the final in Budapest and last eight at Indian Wells. Halep, the second seed, was tested before fighting her way past Polona Hercog 5-7 7-6 (7-1) 6-2. In a blockbuster last-16 clash, Halep will meet Venus Williams after the American three-time champion cruised past 14th seed Kasatkina 6-3 6-1. Also pushed, fifth seed Pliskova needed more than two and a half hours to overcome Alize Cornet 6-7 (3-7) 6-1 6-4. While most of the seeds have progressed in the top half of the draw, only three are through in the bottom, with Wang Qiang – through thanks to Serena Williams' withdrawal due to a knee injury – joining Halep and Pliskova. Pliskova's next opponent is Yulia Putintseva, who eliminated 11th seed Sevastova 1-6 6-2 6-3. Australian Open semi-finalist and 25th seed Danielle Collins also departed, losing to Wang Yafan 7-5 6-1.